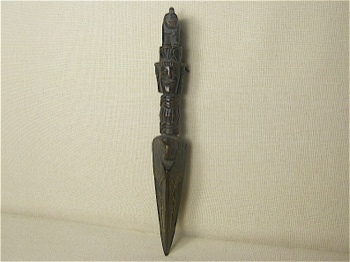 The Phurba is a triple-sided Tibetan ritual dagger or stake (not meant to actually hurt in any way a sentient living being). The different segments and triple blade represent the three spirit worlds while the phurba, as a whole, symbolizes the world's axis and brings all three worlds together. It is regarded as a powerful weapon which subdues evil spirits and negative energies while transforming them into positive forces. 8.75 inch long x 1.5 inch wide.